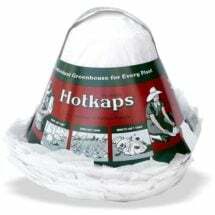 Made of premium grade spun-bond polyester, Harvest-Guard Floating Row Cover has “pores” large enough to let in sunlight, water and air, but small enough to keep out insect pests. Single layer protects as low as 29°F; double layer protects as low as 26°F. 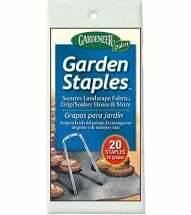 Garden Staples can be used to help secure the fabric. 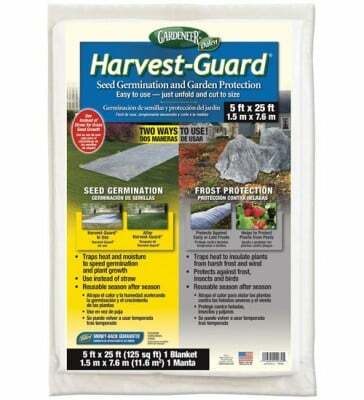 Read our article How to Protect Plants with Row Covers to learn more. Available in THREE sizes — please select from dropdown menu. 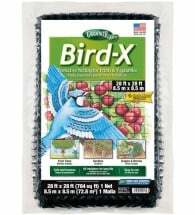 STEP 1: Prepare garden plot and plant seeds, seedlings and young plants. STEP 2: Unfold to desired length (cut in sections if necessary). 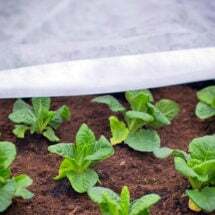 STEP 3: Drape cover loosely over seed bed or plants to allow plenty of slack for plants which grow upright (tomatoes and peppers). STEP 4: Secure to ground every 6 to 8 feet using garden staples, nails, rocks, etc. Double up Harvest-Guard to protect crops from severe frost — single layer protects as low as 29°F; double layer protects as low as 26°F.